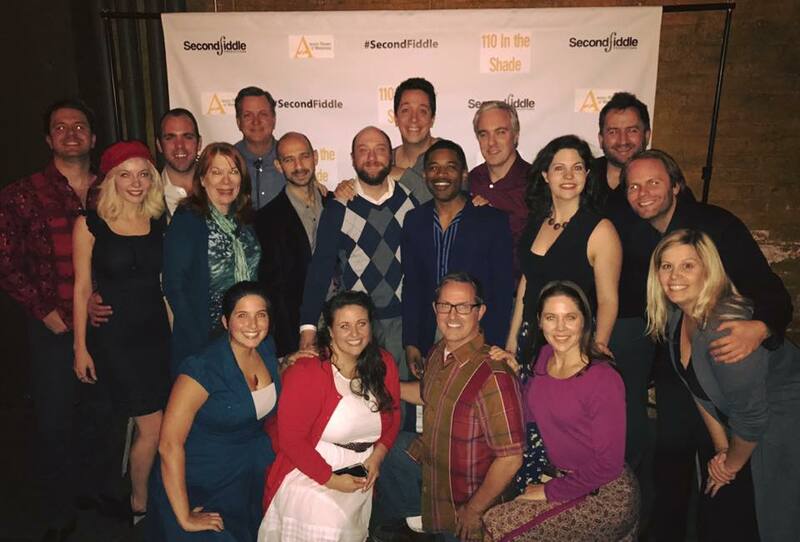 Second Fiddle Productions, the company that brings us one-night-only staged readings of rarely produced musicals, closed their third season with the 1963 musical 110 in the Shade. I became aware of them in the middle of their second season, and now I don't miss a show. It's great for my musical theater education - for a musical theater geek, there are a lot of old shows I don't know, especially if they're not often done. It's also a great opportunity to watch some of the Twin Cities finest music-theater talent tackle something they might not otherwise have the opportunity to. Assuming they get the grant money and donations to keep this relatively simple operation going, they'll be back in 2017 with three more musicals I've never heard of! Watch their Facebook page for details. 110 in the Shade was written by creators of The Fantasticks, based on the Robert Nash play The Rainmaker about a family and a community living in drought (in more than one way) whose lives are changed by the arrival of a mysterious stranger. It's basically The Music Man, except instead of con man Professor Harold Hill selling the concept of a big band, we have con man Bill Starbuck promising to make it rain. But like Hill, what Starbuck is really bringing to the townspeople, and "spinster" Lizzie in particular, is a feeling of hope. He's a catalyst for change, shaking them out of their routine lives and reminding them there's more to the world than just what they know. I saw Yellow Tree Theatre's production of The Rainmaker two years ago and absolutely loved it. The story of the musical is pretty similar, although there's more lightness and humor than the beautifully sad play I remember, but it is a musical. The story is a bit antiquated, with the family desperately trying to "marry off" Lizzie, but if you can look past that, it's more about her wanting to be seen and loved and appreciated, which is what we all want. Starbuck gives that to her, as well as a belief that she deserves those things. The score is lovely, romantic, and funny, with a variety of musical styles. And lucky for us this is one rare musical that's getting two productions this season; I look forward to seeing it at Theatre in the Round next spring. As usual, Second Fiddle has assembled an incredibly talented cast, and the largest cast I've seen. So large that they barely fit on the stage at Camp Bar. There was a lot of great talent in the ensemble that was underutilized, but they sure made the chorus sound great when they all joined their voices together! The leads were all so wonderful that they made you forget this was just a reading - the lovely Therese Walth as Lizzie, Bill Marshall as her sweet father, Paul Coate and Robbie Droddy as her annoying brothers, Kory LaQuess Pullam as the potential love interest sheriff, and a terrific Eric Morris as Starbuck.